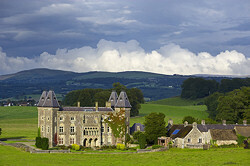 A visit to Dinefwr Park and Castle is a great day out for all the family. You can re-live Edwardian life below stairs in Newton House; climb to the romantic ruins of Dinefwr Castle, once home to the princes of Deheubarth; explore the sweeping parkland, restored to its 18th century glory and walk amongst Dinefwr’s ancient giants – towering trees that have survived for centuries. Restore flagging energy with delicious home cooked delicacies on offer in our inviting tea room and browse in our welcoming shop where locally produced crafts mingle with a wide range of carefully sourced gifts and souvenirs. Discover even more on one of our Hidden House Tours or Deer Park Discoveries or visit for one of our events or exhibitions.